In complete contrast to the previous page, this one is late summery. The baby Robin looks grumpy as only baby birds can! The Robin has to be Britains favourite bird and the most well known, usually because of a Christmas card. These two are perched on top of a classic British style. A controversial scripture this one. It is a reference to salvation, which is a scary thought for some. 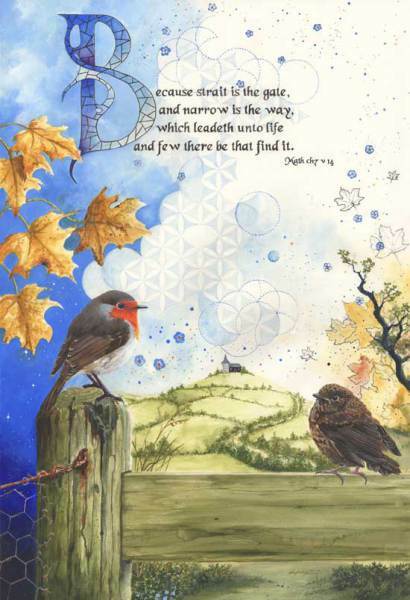 Jesus Himself is the narrow Way. The question that needs to be asked is, if all religions lead to God, then why do so few find it? The answer is simple, they don't. There is only one name under Heaven by which man might be saved. Jesus Christ. It is a straight gate and narrow way and few, not many, which find it. Controversial indeed! I make no apologies for what some, rightly so, view as a narrow point of view. I am a Bible believing Christian. Not perfect, but I do believe.